The Book of Job (Hebrew: ספר איוב, Sēfer ʼĪyōḇ; Greek: Βίβλος του Ιώβ, Biblōs tou Iōb) is the eighteenth book of the Bible. It tells the story of a righteous and prosperous man, named Job, smitten by the devil as a result of the devil's challenge to God. 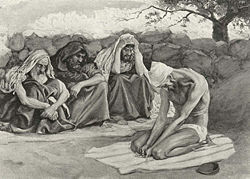 Job maintains his faith in God, but angrily questions four friends who visit him about why God was permitting such suffering. God rebukes Job and his friends, and restores Job's prosperity. The author of Job is unknown, but most Biblical scholars believe the author was Jewish, based on certain references and the use of the covenant name for God, YHWH. The date of occurrence is also unknown, as well as the date of authorship. Most scholars agree the time of Solomon is the earliest it could have been written. Elements of the book which indicate this are Job's age (over 100 years) and measure of wealth (in cattle and land) and the mention of Chaldean and Sabaean raiders. The book of Job shows that even in ancient times, man struggled to reconcile the common paradox "How could a loving God allow evil?" and similarly, "why do the innocent suffer?" Job also marks the first actual manifestation of the devil since Eden, and provides many interesting facts about him, including that he presented himself before God in heaven alongside the angels (Job 1:6), communicated with God (1:7-12) roams the earth (7:1) and has power to inflict suffering (2:7) but only what is allowed by God (2:6). The book is also fascinating to creation scientists because of its vivid descriptions of Leviathan and Behemoth, which fit descriptions of certain kinds of dinosaurs. Job 30:16 mentions "springs of the deep" which would have been unknown to primitive cultures not versed in such marine features. This page was last modified on 29 July 2014, at 12:32.